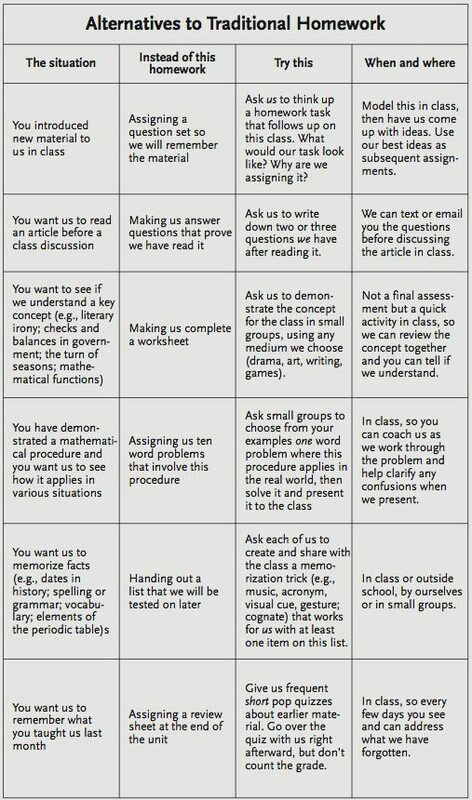 Alternatives to Traditional Homework | We Were Meant to be Teachers! I just saw this chart shared by Allen Shaw on his Leadership in Education site. He’s with the University of Virginia. Why not use this type of homework in this Spring season? Look at this chart and see how you can use it in your classroom from 3rd grade all the way up. I know that most of my students in my previous 3rd grades would have loved this type of higher level thinking. It’s a great to reinforce that the skills we’re teaching them really do matter in their lives. I know I always brought in direct application of Math skills whenever I could. It made the new skill more important to them. This chart is also useful for higher level home schooling children, by the way. This entry was posted on April 12, 2015 by Patricia Dorsey in elementary reading, elementary writing assignments, home school, parental involvement, parents & standardized tests, primary grades, reading instruction, STEM writing, Whole Language, writing assignments and tagged brain breaks, classroom management, Common Core Standards, communication with parents, higher level thinking questions, homework, motivation, new teachers, professional development, teaching ideas.